Annuities are a great way to generate income during retirement. Read about the best annuity companies, tips for investing and more. Fidelity offers three classes of annuities. If you own an annuity and want to switch it to Fidelity, you can get a tax-free, low-fee exchange with their Personal Retirement Annuity. MassMutual has one of the best financial strength ratings in the industry. It offers five types of annuities and is best for those who are new to annuities and how they work. AIG is trusted by nearly 2.5 million people to help them prepare for retirement. AIG is best for those looking to customize an income solution for a portion of their retirement portfolio. From 401(k)s to multiple types of IRAs like Tradtional, Roth and even Precious Metals IRAs, there’s no shortage of retirement planning options for you to look into. Annuities are another great option you might not know much about but can help you with having a steady income during your retirement. Let’s take a look at what annuities are, how they work and the top three annuity companies on the market. We selected the three best annuities companies after researching and evaluating 20 of them. We stacked their ratings from independent companies, benefits, commissions, fees and the financial health of the insurance companies that back the annuities against each other for our evaluations. The annuities companies that ranked highest are AIG, Fidelity and MassMutual. In this guide, we will discuss the types of annuities, share tips for choosing one that will fit your needs and we’ll share our detailed evaluations of the top annuities companies. You will also find helpful frequently asked questions about annuities in this guide. Investing a lump sum with one of our best annuity companies today will lead to a steady monthly cash stream in the future. As with any investment, it is essential to be informed and to understand the costs and the income. Wise investors research the market, annuity companies, types of annuities available, benefits and risks as well as the fees and commissions. 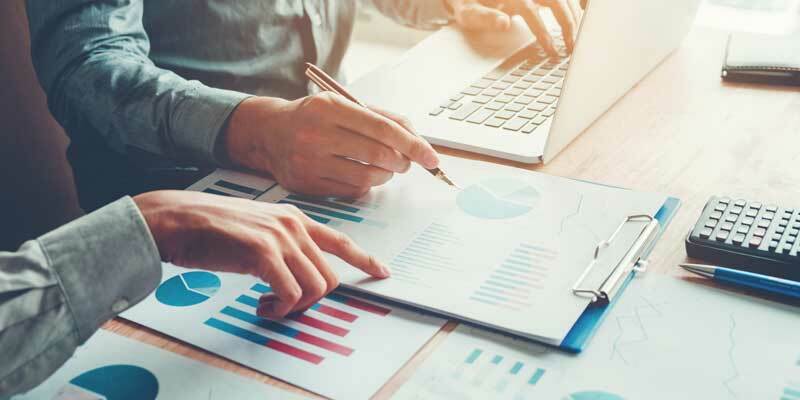 The ins and outs of some annuities are so intricate that even the most seasoned investor can find themselves scratching their head wondering what the best choice is. If you’re new to annuities, start with knowing what this type of investment is: cash invested as a lump sum to produce a monthly income stream for life or a fixed period. The monthly income starts right away if you buy an immediate annuity, or in the future, if you buy a deferred annuity. A deferred annuity provides more substantial payout than an immediate annuity since the backing insurance company has more time to invest your funds. Pension funds are annuities, although this retirement benefit is rarely offered by employers anymore. Social Security is another example of an annuity. Annuities are best suited those who have maxed out tax-deferred contributions to 401(k) plans and IRA plans. The Internal Revenue Service (IRS) defines the maximum allowable contributions to pretax 401(k) and profit sharing plans, and both Roth and traditional IRAs. According to the Insurance Information Institute, there are no limits on the amount that you can invest in an annuity. IRA and 401(k) accounts have hardship withdrawal or loans features if you need money for medical care, education and some other expenses. An annuity is not as flexible; once you make a deposit, the contract locks into a surrender period of two to over 10 years where you will pay fees along with a tax penalty if you withdraw any of the money. Annuities carry annual fees, transfer fees, expense risk charges and other fees. Investor.gov explains more about annuities fees with information from the Security and Exchange Commission (SEC). Be prepared to compare the expenses of retirement accounts or see an independent financial planner for guidance. There are a few types of annuities, like tax-sheltered, singled life, or joint. Low-cost fixed or variable annuities are often the best option as a part of a retirement portfolio. Monthly payments will fluctuate with a variable annuity, while fixed annuities pay out one monthly amount. No annuity is protected or insured, but they are considered safe investments. There are two main types of annuities: Deferred and Immediate. 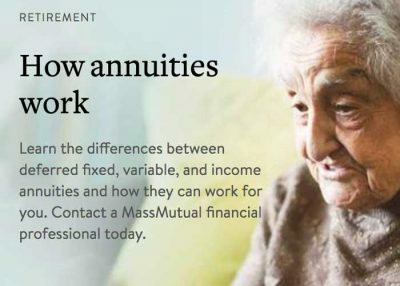 Within these two main categories, your annuity can either be fixed or variable depending on whether your payout is a fixed sum tethered to the market’s overall performance, a group of investments or a combination of the two. Deferred Annuity – If you choose a deferred annuity, your money is invested for a predetermined period of time until you hit retirement and are ready to start making withdrawals. Immediate Annuity – With an immediate annuity, you’ll start getting payments sooner after you’ve made your initial investment. Immediate annuities are good for people approaching retirement age. Another way to look at the two is, a deferred annuity accumulates money over time while an immediate annuity pays out fairly quickly. The main upside to annuities is that they guarantee an income stream and are safe investments. You pay no income taxes until you start to receive payouts in retirement when your income should be lower. If you use pretax dollars from an existing IRA or 401(k) to buy an annuity, the payout will be fully taxed. 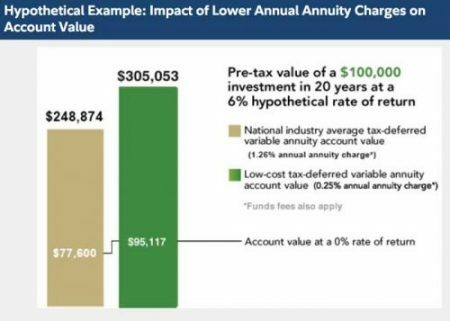 If you buy an annuity with after-tax dollars, you will not pay taxes on the payout portion of your original investment, only the gains. Taxes are assessed at the regular income rate and not the capital gains rate. The downside to annuities is that they are elaborate financial instruments that come with various fees and costs. You should seek professional assistance to help you choose the type that works best with your retirement portfolio and understanding future tax implications. Experts will tell you an annuity is not the first or even second retirement investment you should make. Max out other retirement savings accounts that offer tax-deferral or contribution matching. As a general rule, you should be investing at 15 percent of gross income in these accounts before you consider an annuity. To determine eligibility for Roth and traditional IRAs, see the IRS retirement plan rules. eligible, skip to the next option. non-matched portion of your employer-based plan. income will likely go down in retirement. annuity within an IRA if you prefer. You can buy annuities directly from the insurance companies that issue them, or from independent brokers, banks and other financial groups. With over 40 major insurance firms issuing annuities and hundreds selling them, knowing where to start your search can be daunting. Luckily, we did the hard work for you. Our in-depth annuity analysis focuses on each company’s industry reputation, the variety of offerings and other criteria. We researched the top 20 annuity companies, then narrowed the list to our top three based on specific criteria we set by extensive research of government and consumer information on investing wisely to get the best of both worlds — benefits now and benefits down the road. The result was a list of three of the best annuity companies. After our evaluation, we chose the best annuities companies. Each of these companies stood out above the competition. Founded in 1946, Fidelity is known as one of the world’s most successful retail investment services firms, known for many firsts in the industry. Fidelity was the first to offer a web-based wealth management platform, money market funds with check writing features and was the first mutual fund company with a website. Asset Accumulation: Fidelity Personal Retirement Annuity (minimum investment $10,000) or Deferred Fixed Annuities (minimum investment $5000). Asset Protection: For transitioning into retirement, Fidelity’s Deferred Income Annuities (minimum investment $10,000) and New York Life Clear Income Fixed Annuity – FP Series (minimum investment $50,000) are worth considering. Income Generation: If you’re already living in retirement and want to make sure you don’t outlive your money, Fidelity offers Immediate Fixed Income Annuities (minimum investment $10,000). With over 165 years of insurance and investments experience, MassMutual has one of the best financial strength ratings in the industry. Respected financial strength rating companies give MassMutual high marks. A.M. Best posts a superior A++ rating, Moody’s rating is Aa2 (excellent), and Standard & Poor’s rank is AA+ or very strong. Deferred Fixed Annuity: This option has a guaranteed fixed interest rate, tax-deferred growth and principal protection. Variable Annuity: This annuity option has tax-deferred growth potential, a range of investment choices but has a potential for loss in value. Fixed-Index Annuity: This option has tax-deferred growth or, if you elect the guaranteed lifetime withdrawal benefit, you can meet predictable income goals. Immediate Income Annuity: As the name suggests, this option is best for those with immediate income needs. Guaranteed income starts within 13 months of the issued contract. Deferred Income Annuity (DIA): This option is best for future income needs. In the midst of the 2008 worldwide financial crisis, AIG became the poster child for everything the pundits said was wrong with Wall Street, insurance, banking, and economy when they accepted a $182 billion bailout from the U.S. government. Not quite five years later, AIG repaid that debt with an additional $22.7 billion from profits. The company invests in analytical tools as well as client-focused experts and has garnered a Business Innovation Award annually for the past eight years. Today, nearly 2.5 million people trust AIG companies to help them prepare for retirement. AIG’s annuity products offer something for everyone regardless of whether you are in the early stages of saving, already in retirement, or somewhere in between. Polaris Variable Annuities Two options for Polaris Variable Annuities offer growth potential, family protection features, and a variety of optional retirement income protection features. Index Annuity Products This option is great for those who are planning for retirement or seeking guaranteed lifetime income. Three types of Index Annuity Products offer growth potential based in part on the performance of a market index. Assured Edge and American Pathway Annuities offer guaranteed interest earnings, protection from market volatility, tax-deferred growth and access to your money. American Edge Immediate and Deferred Income Annuities offer a predictable income stream with flexible payout options. I already have a 401(k) or an IRA so why should I consider an annuity? According to the IRS, the maximum contribution in 2018 for employees who participate in 401(k), 403(b), most 457 plans and the federal government’s Thrift Savings Plan is $18,500. The contribution limit for IRAs for 2018 is $5,500, or up to $6,500 if you’re age 50 or older. Since deferred annuities have no IRS contribution limits, you can invest as much as you want for retirement as a tax-deferred investment. What are the two phases of annuities? The two phases of annuities are the accumulation phase and the distribution phase. During the accumulation phase, you put money into the annuity with a lump sum, monthly payments or a combination the two. Your investment grows during this phase. The distribution phase, also known as the annuity phase or the annuitization phase, is when you start receiving payments from your investment. What is a surrender period? The surrender period is the length of time an investor has to wait to withdraw funds from an annuity without incurring some fees or income tax penalties. Depending on the contract terms, this can be years. What are the types of fees associated with annuities? While each insurance company, financial institution and brokerage firm has different combinations of products, options and terms, three most common types of fees are commissions, surrender charges, and annual fees. Fees can include insurance charges, investment management fees and fees for riders. Lump Sum Distribution– beneficiaries receive the funds as a lump sum amount. Non-Qualified Stretch– beneficiaries receive minimum payments stretched over their life expectancies. Five-Year Rule– beneficiaries can withdraw amounts during a five-year period or withdraw the entire sum in the fifth year. Without the clause, the funds revert to the insurance company. Once you determine that an annuity is a sound idea for your retirement portfolio, the earlier you buy into a deferred annuity contract, the higher the monthly income stream will be. A difference of 10 years between making a lump sum investment into an annuity can mean the difference of hundreds of dollars a month in income. You will need to know how much the investment will cost in fees and possibly penalties, and how much you can expect to receive once you retire. Annuities are an investment option that can work well but are not appropriate for all retirement savings plans. Creating a tailored investment plan for you and your family is never “one size fits all” and should be methodically planned out with the advice of professionals. Do your homework before investing in an annuity and take the time to read plan documents and to ask questions until you understand how the annuity you’re considering works.